There are many ways to look at the long history of Albany and the surrounding region: politically, economically, architecturally, and so on. Craig Gravina and Alan McLeod have chosen to do so through beer-colored lenses. 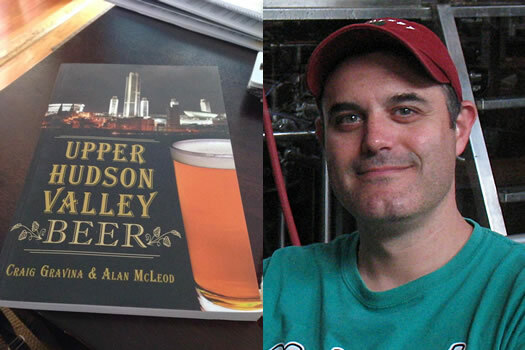 The two beer scholars -- you might remember them from the Albany Ale Project -- have teamed up to write Upper Hudson Valley Beer, a book about the rich history of brewing in this region and its resurgence over the last few decades. There's a launch party for the book -- with a beer tasting -- at the Albany Institute on September 11. We bounced a few questions to Gravina this week about the role of beer in Albany's history, the state of the region's beer scene today, and where it might be headed. Let's start with a challenge, a totally unreasonable question: What's the history of beer in this region in 100 words or less? 100 words! Yikes! I don't know if I can do that, but if I go over just cut me off mid-sentence. For me it can be summed up in two words--ale and distribution. Brewing in the Upper Hudson Valley is very much an ale story. The Dutch, the Brits, the 19th century Albany Ale brewers, they all made ale. Even after lager gained popularity in the late 1800s, the Upper Hudson Valley still stay ale-focused. Lager was brought in from the midwest and New York City, but as far as being manufactured in the area, it never totally caught on. 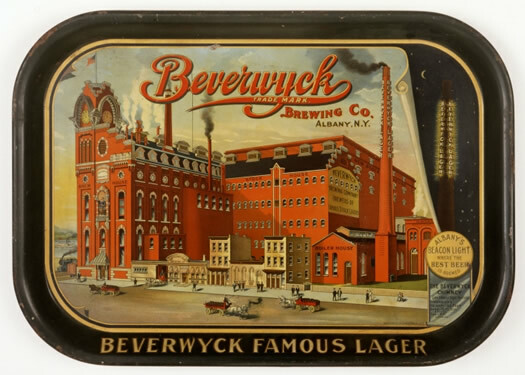 After prohibition, Beverwyck Brewery's (the largest post-repeal brewery in the area) most popular beer was its Irish Brand Cream Ale. Even... [And that's 100 words. Let's go to the judges for a ruling... yes, they're going to let you continue.] today, most local micro, nano, and brewpubs around the Capital Region make mostly ale. I know I'm going long, but distribution is also important. Killian van Rensselaer, as early as the 1630s, had every intention of making Rensselaerswijck a brewing hub for New Netherlands, and said as much. When the Erie Canal opened in the 1820s, Albany was perfectly located to receive raw brewing ingredients -- hops and grain -- moving east on the canal, and was able to then turn those ingredients into beer, which was then shipped south to New York, and onto the rest of the world. For much of its brewing history, this area really had a lock on distribution. You wrote recently that ,historically speaking, "beer does not exist in a vacuum." What are some of the ways beer has intersected with larger events in this area? It's not so much an intersection, more of an omnipresence. We realized very early on when we were writing Upper Hudson Valley Beer that we weren't telling the story of beer in the Upper Hudson Valley, but rather we were telling the history of Albany and this area through beer-colored lenses. We realized very early on when we were writing Upper Hudson Valley Beer that we weren't telling the story of beer in the Upper Hudson Valley, but rather we were telling the history of Albany and this area through beer-colored lenses. I think one of the best cases of this is Hedrick beer. Many people over the age of 55 in Albany remember Hedrick. Is that because Hedrick was an amazing brew? No. They knew that Dan O'Connell owned the brewery, and as the head of the Albany County Democratic Party from the 1920s until the 1970s, if you didn't serve Hedrick at your bar, you didn't have a bar! A lot of this area's history is beery, but not overtly; beer sort weaves its way in and out of the 400 years since European settlement. O'Connell, again is the perfect example of that. His story is far larger than beer, he was essentially a corrupt, politicized gangster who ran Albany for fifty years. Yet, beer is still part of the story. Can Boss Tweed say that? What are some ways you think that understanding the history of beer in and around Albany can help us better get a sense of what this place is -- and it how it got to be the way it is now? I think that's why I wanted to be involved in the Albany Ale Project in the first place. I'm amazed after living in Albany since 1984 -- (Don't tell anyone, but I'm not native. I was born in Chicago, but nothing interesting ever happened there.) -- that first I'd heard that Albany was a brewing center was in 2010. It's like that part of the city's history was surgically removed. Beer helped to shape Albany and Schenectady and Troy and Hudson. It wasn't just a pint at a pub or a bar, although that was part of it. Beer and brewing was people's livelihood, and a major industry in this area for a very long time. It was part of the fabric that made Albany what is is today -- both good and bad. Again, the history of beer in the Upper Hudson Valley is the history of the Upper Hudson Valley. How would you describe the state of beer in this region today? And what direction do you think it's headed? The Capital Region has an amazing beer drinking scene, but a horrendous beer making scene. That's not to say the breweries and brewpubs are bad -- far from it. Crossroads, Druthers, Shmaltz, Beer Diviner, Chatham, they all make some really great beer. But for the most part, we drink other cities' beer. I think that's a shame. Bill Newman opened the first microbrewery west of Colorado, right here in Albany, back in 1980. Not the first in this area, or the first in New York, the first one on this side of the country! What happened over those thirty some-odd years? Why can I count on my fingers the numbers of breweries in this area? Why isn't Albany the Portland, Oregon of the east? I'm baffled by that. It's getting better, but sheesh, it's been a slow process. It seems like every other month there's a new brewery or beer bar opening in this area. What's your take on the craft beer wave -- and can it be sustained here? You've been reading my blog haven't, you? I'm not a big fan of the term "craft" beer. "Craft," to me, is just a marketing term. Be a brewery, make good beer, and don't worry about being artisanal. That being said, I think local is the key. Green Wolf Brewery in Middleburgh is a great example of that. Middleburgh is a cool, little town in the middle (no pun intended) of nowhere and now they have a their own brewery. They support the town, and the town supports them. ... I worry some folks are getting in over their heads. It's one thing to make good homebrew, its quite another to be a good business person. That's what happened during the brew pub craze of the 1990s. I hope I'm wrong. As far as sustainability goes, I don't know, I waffle on that. I'm wary of nano breweries -- which many of these new breweries are -- because nanos beat the system, and the system isn't meant to be beaten. Conventional thought, ten years ago, was all about scale. Start with a 10-barrel system, and expansion -- hopefully due to demand -- will be easier. One-, two-, and three-barrel nanos are altering that thought, and more and more people are getting into the brewing biz. But I worry some folks are getting in over their heads. It's one thing to make good homebrew, its quite another to be a good business person. That's what happened during the brew pub craze of the 1990s. I hope I'm wrong. The two of you have been working on the Albany Ale Project, which has already resurrected one of Albany's historical beers. What's next? A whole buncha' things! In the near future we'll be promoting the book. On September 11, I'll be doing a book signing and beer tasting at the Albany Institute of History & Art from 6 to 8 pm (tickets are available on their website -- and the price includes a book and beer!). I have to say, the Institute has been an amazing partner. We really couldn't have put the book together without their help. Two weeks later on September 23, I'll be at Market Block Books in Troy (with a few friends from Brown's Brewing Co.). And two days later my co-author Alan will be joining us here in Albany! On September 25, we'll be at Brown's for a book signing/beer release shindig. Brown's was gracious enough to brew a beer for us in celebration of the book. It's a tribute to Thomas Read, a rather forthcoming Troy brewer of the 1830s. This one isn't so much of a recreation, as was the 1901 Albany Ale we brewed with CH Evans, it's more of a bridge between the past and today. A tip of the hat to old Troy with some modern malt and hops! It should be tasty! On Friday the 26th, we'll be at the Lionheart, in Albany, for a happy hour signing (5pm) and then at SUNY Cobleskill, on Saturday the 27th, for their Grain to Glass brewing seminar/beer event, so stop by and say hi! We'll be doing more events as well, into the fall and winter. We'll make sure to keep everybody up to date. As far as the future of the Albany Ale Project, Alan and I have a few more projects in the works--maybe another book, too! Excellent interview and Thank You Craig Gravina and Alan McLeod for writing this book! What a tribute to Upper Hudson Valley Brewing - I can't wait to read it! If anyone out there is interested in tasting 'today's' local brewing history, you can taste and experience it in person at our tasting station courtyard for our non fundraiser for education programs for the Capital Region Audubon Society - OktoBIRDfest! Druthers Brewing Co., C.H. Evans, Steadfast Brewing, and possibly The Beer Diviner will be featured tasting stations at the Albany Visitors Center also happening on September 27th. We're excited to support local brewing businesses at our event!